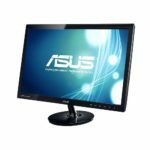 If you’re in need of an affordable and reliable monitor for casual gaming, movie watching, or any other multimedia activity, the ASUS VH236H is the monitor for you. It features a rapid 2ms response time for fluent gaming, a crisp Full HD resolution for high-quality movies, and some extra features including the built-in speakers and optimized picture presets. The ASUS VH236H features a TN panel which allows for the quick 2ms response time that eliminates ghosting of the fast moving objects even in the fastest actions in video games. In contrast to the IPS panel monitors, TN panels deliver significantly less rich colors which make it unsuited for the professional color-critical work. However, they are more affordable and don’t suffer from IPS glow or backlight bleeding. Additionally, the viewing angles of the ASUS VH236H amount to 160 degrees horizontally and vertically which means that when you look at the screen from different angles, the colors will shift in colors. You can always solve this by tilting the screen of the monitor to match the angle at which you’re looking at the screen. The colors won’t be affected when you’re directly in front of the monitor. The OSD buttons at the bottom bezel of the ASUS VH236H can be used as shortcuts when the OSD menu is not active. These shortcuts include swapping between the picture presets, volume control, quick contrast/brightness adjusting, and toggling between the input sources. All of these can be adjusted in the menu as well as additional settings such as aspect ratio, skin-tone, and color temperature. The mentioned pre-calibrated picture presets include optimal settings of brightness, contrast, sharpness, and colors in order to best suit the activity on the screen. They consist of five modes including Scenery, Theatre, Game, Night View, and a Standard configurable mode. These modes make use of the dynamic contrast ratio, or the ASUS Smart Contrast Ratio, which allows them to provide an image with dark black shades and bright white tones. 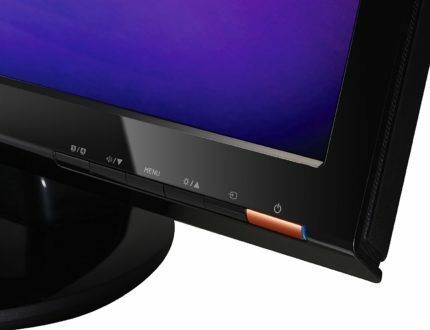 The design of the ASUS VH236H features a beautifully glossy black cabinet and an easily detachable and stable base. The monitor is VESA mount compatible for easy installment on the wall or a mounting arm with 100 x100mm holes. Additionally, you can tilt the screen of the monitor by -5, 20 degrees, but it cannot be height adjusted, rotated, nor swiveled. At the back of the monitor there one of each: VGA, HDMI, and DVI ports as well as an audio port for the built-in speakers of 2W each. The speakers provide a decent sound quality although not loud and clear enough to replace a standard external speaker set, but nice to have around as backup nonetheless. 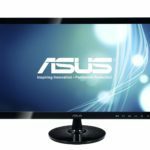 At the moment (March 2017), the ASUS VH236H is unavailable. Once it is, it should be priced around $120 in order to match its performance and picture quality with the price. 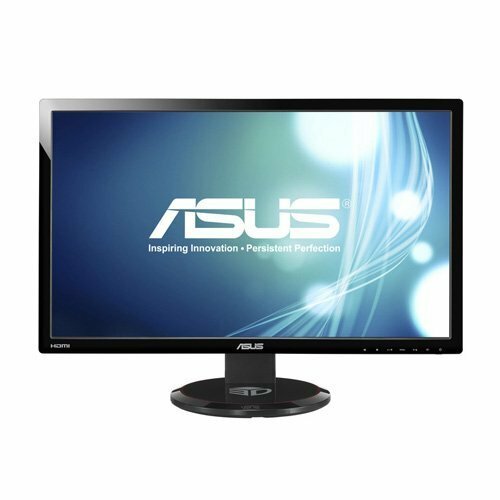 More importantly, there is a newer version of this monitor available, the ASUS VS239H-P. For only $130 it offers an IPS panel with the impeccable viewing angles, crisp Full HD resolution, and vibrant image quality with vivid colors. You can also check our review of it here. 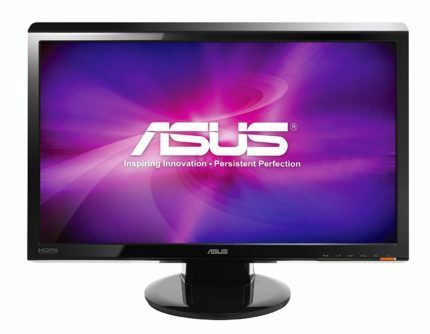 The ASUS VH236H is an excellent budget monitor for casual gaming, movie watching, and all-around everyday use. With it, you’ll be able to enjoy high-quality 1080p gaming with zero ghosting and trailing in fast-paced video games and watch movies in Full HD resolution. Moreover, the built-in speakers and the well-optimized picture presets will make sure that you have a whole multimedia experience, packaged in one sleek and modern looking monitor. The ASUS VH236H is a budget monitor that offers crisp Full HD resolution and quick 2ms response time for a fluid gameplay and immersive movie watching experience. Moreover, it offers some exclusive features such as the built-in speakers, pre-calibrated picture presets, and plenty of connectivity options. You can overclock this monitor to about 74hz no problem. !